Washington Redskins linebacker Trent Murphy is coming off of a nine-sack season in which he dealt with adversity every step of the way. Murphy was asked before the 2016 season to add more weight in order to transition to playing defensive end for the Redskins. Murphy did as he was told and added the weight only to be asked a few weeks later to cut the weight and go back to linebacker after Junior Galette injured himself again. In the aftermath of adding and then cutting weight Murphy found himself in trouble for using a weight-cutting, over the counter additive that just so happened to also be on the league’s banned list of substances. The result: a four-game suspension that Trent has owned and attempted to move on from graciously. 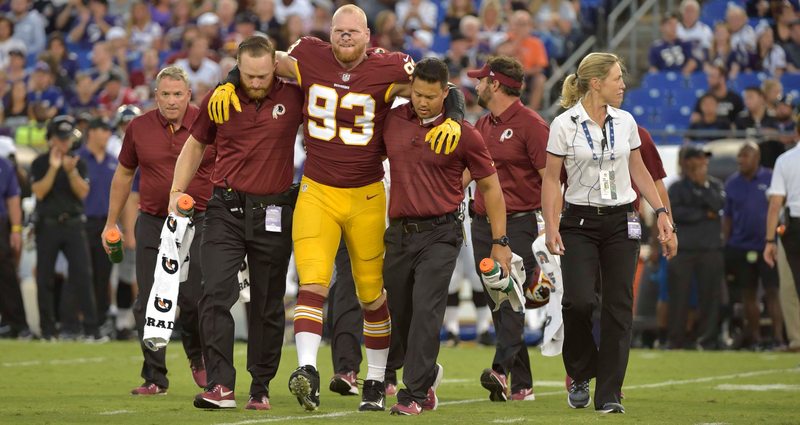 Washington LB Trent Murphy has a torn ACL, as @nflnetwork reported, but also has a torn MCL as well, per source. Season-ending injury. As it turns out, that four-game suspension is the least of Murphy’s worries now as the fourth-year linebacker was hurt in last nights preseason opener against the Ravens. Results from the MRI that Murphy underwent Thursday showed that he tore his ACL and MCL in his knee and will miss the entire 2017 season. Murphy was having a stellar camp despite the fact that he was going to have to miss the season’s first four games. Redskins safety Su’a Cravens had an MRI Friday as well, and the results showed that Cravens simply “tweaked” his knee and will miss two to three weeks while he recovers.